A twist on the classic pesto. Perfect for pasta and sandwiches. Preheat oven to 350 degrees. Lay walnuts out flat on a cookie sheet. Once oven is heated, bake for approximately 10 mins or until lightly browned. You will know they are perfectly toasted the minute you smell toasted walnuts. Let cool. In a food processor blend all ingredients until fully incorporated. 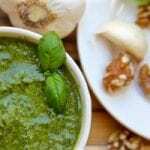 Add more basil if needed until pesto is a vibrant shade of green.